We are all living active and full lives, often at a distance from family and friends who are important to us. Connect with your child whether you are traveling in Tuscany or just across town. grandreads is a service that will last far beyond the length of the subscription. We select and send books at regular intervals. The book is gift-wrapped and shipped with a gift enclosure from you. Special occasions can be noted on the gift card, such as Happy Birthday, Back to school, Summer time, Missing you. We have several levels and frequencies from which to choose. Subscription prices at all levels include individualized book selection, gift-wrapping, shipping and handling and an enclosure gift card. In addition, you will receive an email each month confirming the shipment, the title, and a book summary. Cancellation policy – The service may be cancelled at any time with 30 days notice. To avoid duplication of books already owned, books will be selected from new releases whenever possible. Family members may also request specific titles. A single subscription may be shared among siblings. The board book program (suitable for children up to three years of age) costs an average of $13.25 per month. This cost includes individualized book selection, the book, gift wrapping, shipping & handling and the personal email to the giver. The picture book program (suitable for children aged three years and up) costs an average of $22.00 per month. This cost includes individualized book selection, the book, gift wrapping, shipping & handling and the personal email to the giver. 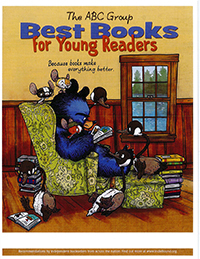 To enroll a child in the Redbery Books grandreads program, fill out the on-line form or contact Maureen at Redbery Books 715-798-5014. If you have any questions, please contact Maureen at Redbery Books 715-798-5014 or stop by the store and talk to Maureen (please call ahead to make sure that Maureen will be in when you stop). "This is a great service and makes me look good every time the books arrive." "Thanks for this service. I wish I was a kid so I could have all these great books sent to me. They call me whenever the books arrive to tell me." "We love this service! You're contributing to my grandson's development in a meaningful way." "Can there be any better gift for a child than a wonderful book selected just for them by a knowlegeable lover of children's books?" "What a grand idea! And the best part of it is that each book that's sent will be carefully chosen to match a child's tastes, age, and interests."